In a food processor, finely ground the pistachios. 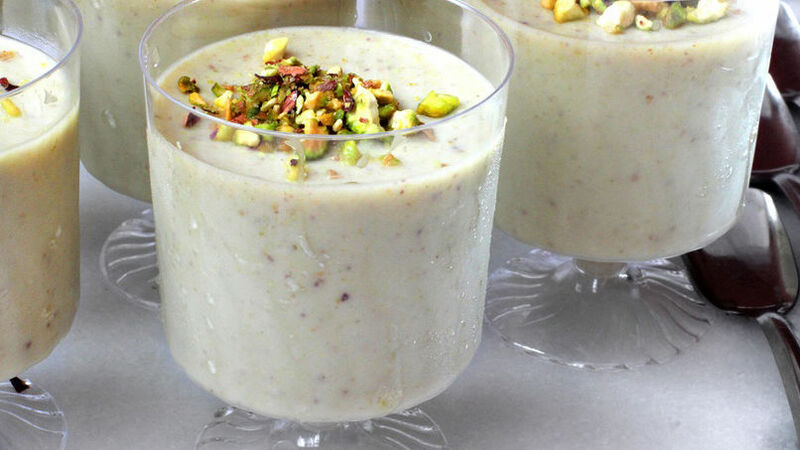 Pour the coconut milk, cream and ground pistachio into a pot. Cook over low heat for 15 minutes; add the sugar and vanilla and beat until thoroughly mixed and the sugar has fully dissolved. Heat the water in the microwave for 40 seconds. Add the gelatin and mix until fully dissolved. Add to the pistachio preparation and stir with a spatula until combined. Pour in 8 individual molds, letting cool before placing in the refrigerator. Serve cold, garnished with pieces of pistachio. I recommend serving this dessert with a berry and liquor sauce. If desired, use skim or almond milk in place of the coconut milk. The recipe I’ve prepared today was inspired by the traditional Christmas dessert known as tembleque. It’s prepared with coconut milk and cream, and other spices which give it a fragrant touch. Panacotta, on the other hand, is a very popular Italian dessert prepared with cream and milk, the flavors achieved by adding fresh or dried fruit and other spices. Both desserts are super easy to prepare, the outcome always creamy and delicious. If you like these desserts, you’re going to love my pistachio panacotta tembleque.